The members of Misbourne Matins Rotary Club have been collecting at Heathrow Airport for BBC Children in Need since 1990, making 2014 their 25th Anniversary. 2014 - Rotary Clubs of Misbourne Matins and Marlow Thames - collecting at schools and Heathrow Airport. If you would like to get involved in the largest Rotary collection for Children in Need, fill in your details and we will send more information! 2013 - Rotary Clubs of Misbourne Matins and Marlow Thames - collecting at schools and Heathrow Airport. On 15th November 2013, over 150 Rotarians from 25 clubs in the South East of England descended on Terminals 1 and 5, Heathrow airport to collect money for BBC Children in Need. 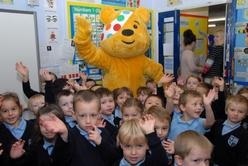 They were successful, collecting over £17,000. Add that to their collections at local schools and the grand total for 2013 was £21,500. In 2014, they will be at Heathrow on 14th November from 6am until 8pm, collecting from the public who use the airport that day. For updates visit their twitter page HERE or facebook page HERE and get involved. For Photos from the week of collecting, click HERE. 2012 - Rotary Club of Misbourne Matins - collecting at schools and Heathrow Airport. 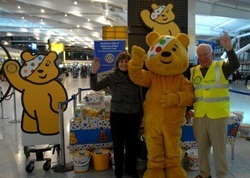 On 16th November 2012, over 100 Rotarians from the South East of England descended on Terminal 5, Heathrow airport to collect money for BBC Children in Need. They were successful, collecting over £12,000. Add that to their collections at local schools and the grand total for 2013 was £15,200. 2011 - Rotary Club of Misbourne Matins - collecting locally and at Heathrow Airport. 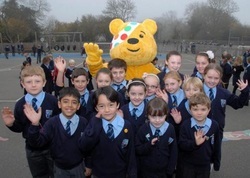 On 18th November 2011, over 100 Rotarians from the South East of England descended on Terminal 5, Heathrow airport to collect money for BBC Children in Need. They were successful, collecting over £11,000. Add that to their collections at local schools and the grand total for 2013 was £14,180.